The Leafs have been eliminated from the Playoffs and while the season melts down into yet another controversy I don’t feel like wasting my time caring about (Bernier spoke the truth? For shame! Kessel and the coach are at odds? I doubt we’ll be seeing much of either of them come June, so who cares?) we can now safely turn our attention to the summer and participate in the one thing that is fun about cheering for a bad team: the future. The Leafs (barring a late-season winning streak by the Oilers or – God Forbid! – themselves) look firmly entrenched in 27th place, which means that they will (barring their own lottery win, or one by a team below them) likely pick fourth in the upcoming draft. That means a likely choice between Dylan Strome and Mitch Marner. If I am the Leafs in this position, I’d be kinda mad. Eichel or McDavid give us the no-miss #1 C the team has craved since Sundin and potentially the type of generational star that Toronto has never seen. Noah Hanifin as a partner for Morgan Rielly for the next decade is the next best possible outcome, but a consolation prize of Dylan Strome – who I’d take right now based off what I can read about both players at this time – is nothing to scoff at. Strome is 6’3 centre who’ll be over 200lbs by the time he suits up in the NHL. That’s size almost comparable to Joe Thornton, and his pass first, “not a great skater but supreme vision and passing skills” sound reminiscent of Thornton’s own scouting report (although I get the impression that Strome likes shooting a bit more). Besides Joe Thornton, I’ve heard Nick Backstrom and John Tavares as NHL comparables, with the “aggressiveness of a Perry or Kessler” thrown in for good measure. Since Marner projects as a winger and I’ve had about my fill of a team built around soft forwards, I’ll be very, very happy to pick-up a brand-new Strome Leafs Jersey the day after the draft. (If that sounds like I’m calling Marner soft, I’m not. I just like how aggressive Strome sounds like he is). The Leafs currently hold the free-falling Predators’ first pick, but before moving on to that pick, I’d like to indulge our collective fantasies in some good-old-fashioned trade talk. In my opinion, the Leafs need to reboot this entire roster. Outside of young players like Panik and old players with no value like Robidas, I would be willing to move anyone and everyone, with the exception of Kadri, Gardiner and – of course – Rielly and Nylander. While I have written in his defense and have also suggested that we not be so hasty to move him out of town, I think that ship has sailed. When it’s all said and done, watching Hamilton have a Norris Trophy worthy season while Seguin competes for the Art Ross makes me sick to my stomach. Sorry to everyone I ever tried to convince about Brian Burke’s genius or the merits of that trade. But, that can’t affect our evaluation of the current asset and Kessel’s potential measured against wasting his prime years as the team rebuilds and the fact that he’s coming off more and more as a petulant baby by the day, makes me think he isn’t worth the headache. Send him to a team that will love his scoring where he can be a complimentary piece like he should have been here. To that end, I trade him on the draft floor to the Panthers for their first round pick (11th today) Erik Gudbranson (6’5 former #3 overall pick with a 49% CF and being utilized basically as the Panthers 6th D, with the caveat that he does play some tough shut-down minutes) and Rocco Grimaldi (potential superstar if not for the fact he is 5’6, 160). I believe this is a realistic package for a player who has 50 goal potential and is (removing this year where he was really unlucky as well as in a horrible situation) in his prime. The Leafs get a pick, a failed pick who might turn out to be really good and a prospect with crazy potential in the Theo Fleury mold. As the pretend GM of the Leafs, I surprise the hockey world by trading both of my star wingers on the draft floor. The reasoning: if you’re gonna rebuild, do it right. I send JVR to the Islanders (desperate for a star winger to round out the Tavares/Okposo combo after losing in the Conference Final) in exchange for potential star defenseman Griffin Rienhart, a 6’4 200lbs player with massive potential who the Islanders don’t really have a spot for at this time. I trade Tyler Bozak to whoever wants him for whatever they’ll pay for him and then count myself lucky to be rid of his contract. 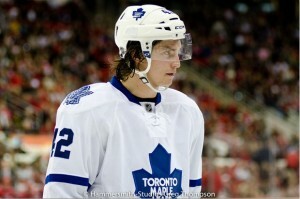 The same goes with Joffrey Lupul. Any 2nd to late round picks these turkeys might bring back are pure gravy. He’s actually better than you think, but the team in front of him is so bad (for example he’s faced 40 shots or more in roughly a quarter of his starts) it’s hard to notice. I think a team in need of a goalie would want him and so after the Jets fail to advance past the first round, the Leafs send him west in exchange for Alex Bermistrov. Bermistrov is a 23 year old former first rounder who couldn’t get a contract done with the Jets and is playing in Russia. He remains an intriguing NHL prospect who is a good skater and above average defensive player, and it would be a coupe for the Leafs to get him. 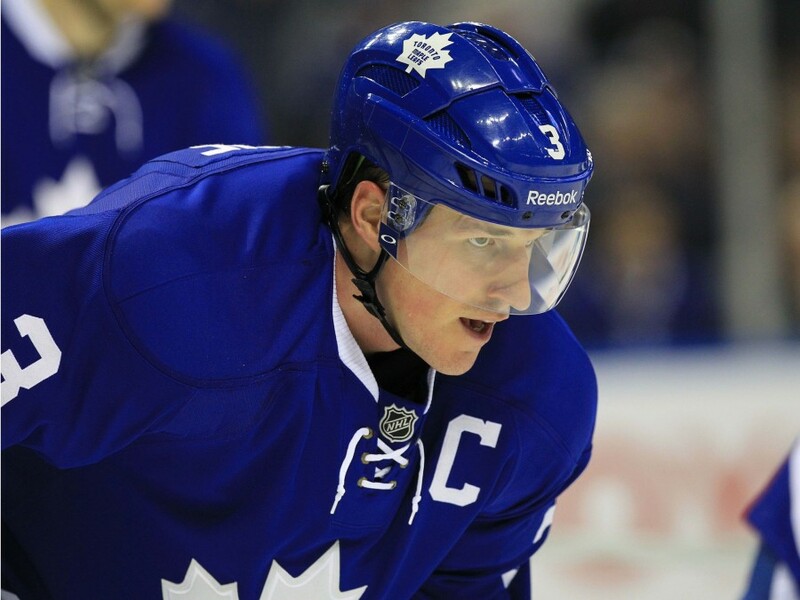 It will make me sad to see the Leafs trade their captain, and who knows – maybe they won’t. If you move out the rest of the current core group and realize that Dion makes an amazing #3 and a pretty good #2, it’s not the worst idea to keep him. But, I want to burn this mother to the ground, so I trade him anyway, even though he get’s a bad rap and is a way better player than most Leafs fans are willing to admit. While Detroit is the obvious destination, they refuse to send me Anthony Mantha and I end up trading Phaneuf to the Stars for the 5’11 defenseman Julius Honka (14th overall last year) and a second round pick. Now that the Leafs have acquired Florida and Nashville’s picks, it behooves us to see who is available at the spots they will potentially pick at. 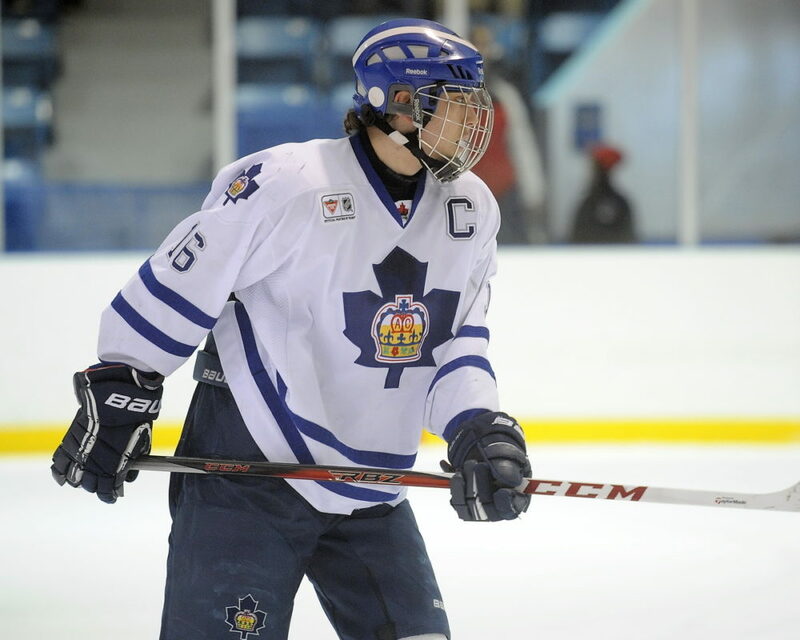 With Florida’s 11th overall pick, the Leafs take Jakub Zboril. Zboril is a fast skating defenseman with decent size who can fit the mold of the puck-moving, high possession team the Leafs want to build. He projects as an above average two-way defenseman with a heavy shot and “high hockey sense” (Craig Button). With the Predator’s 20th overall pick, the Leafs take Jeremy Roy. Roy is an offensive defenseman who has an extremely high ceiling, based on everything I can gather about him. He may be similar to Zboril, but I think hockey teams are built through the blueline, so I take him and hope that one or the other turns into a star puck-mover. Now, I get that it’s easy to be cynical, but this is just a fun activity. Do I overate what teams may pay for the Leafs players? Probably. Are the Leafs likely to make four or five trades leading up to the draft and end up with three first round picks? No. But who cares? The team has been brutal this year and it’s a fun activity to image what the team might get in return for tearing this thing down. Let us look at what a future Leafs lineup may look like, assuming they could actually pull off anything close to what I’ve proposed here. OK, I know it isn’t exactly realistic, but how ecstatic would you be if after this summer, the Leafs rebuild resembled anything close to this? Phil who?